I went to check the top hive feeder early last evening, and I am glad that I did. One side was almost empty, and the other was also very low. I don’t think the girls really liked me opening the top of the hive so close to sundown, and I had a few dive bombers in my face. 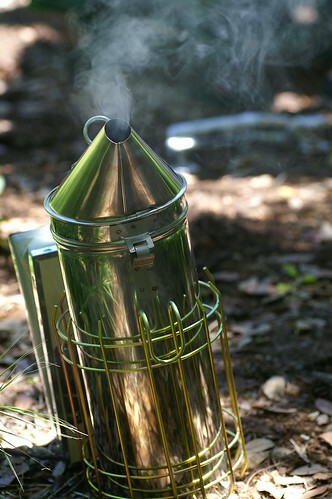 I didn’t bother with the smoker since I was just filling the feeder, and I wasn’t technically opening up the hive. The suit did its job and I didn’t get stung. In reality, there only seemed to be a few angry bees, and the rest of the hive will be thankful not to run out of syrup before I get back this weekend to do a more thorough inspection of the hive. I’ve used my smoker twice now and getting it lit and smoking properly definitely required a little trial and error. It helped that I got some compressed cotton smoker fuel when I originally ordered all my equipment, and this burns very well and the smoke is “cool”. You definitely don’t want smoke that is mixed with sparks and feels like a blast furnace. I’m told bees don’t like that. I’ve heard all sorts of explanations on why smoke calms down bees. One theory is that it simulates a forest fire so the bees go down into the hive to start eating all their stored honey in case they have to leave the hive. Another is that it masks the alarm pheromones given off by worker bees when the hive is opened up. Whatever the real explanation, it certainly works. 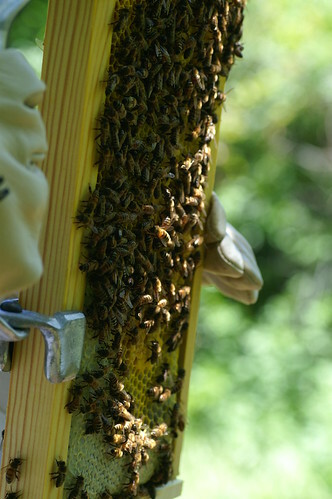 It is important to have a reliable water source near your hive for your bees. 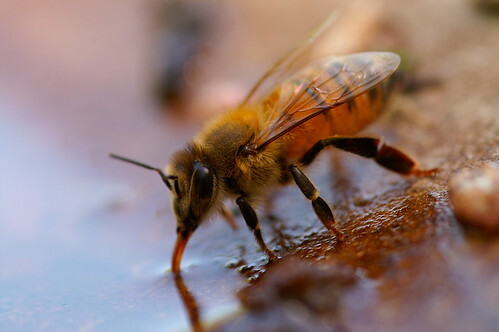 Bees use water to feed brood, dilute honey and control the temperature in the hive. The owners of the property where I keep my hive have a shallow bird bath about 30 feet from the hive and took this great shot of a worker filling up for the road. One important thing to remember is to make sure the water source is either shallow enough so the bees don’t drown or have plenty of floats available for the bees to land on. I’ve heard of some beekeepers saving wine corks and using those for floating bee perches. I am having trouble getting a closer look because it moves very fast and never stays in one place for very long. Even when it lands on a flower, it doesn’t spend much time on it. It also can hover in place like a hummingbird. 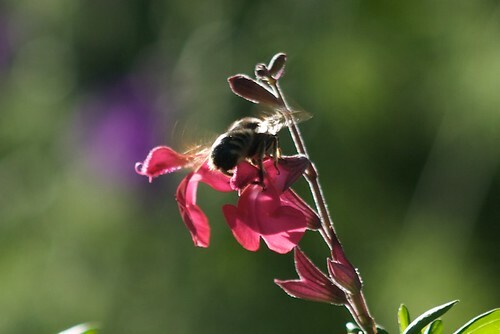 I’m assuming it is some sort of bee, but until I can get get a decent non-blurry picture, I’m going to have a difficult time confirming. This weekend will be a milestone check on my hive’s health. Last weekend I confirmed the queen’s release, and this weekend I will look for evidence that she is laying eggs. If I see evidence of a good egg laying pattern then I can breathe a bit easier that the first major hurdle of a new packaged bee hive has been cleared.